King Sports International: Let the children play! During a recent visit to Fiji I took the opportunity to study the conditions in which athletes are developed. Having been there before, and having been raised in a similar environment, I had certain expectations. The question was had things changed, had the influences of western world habits and trends risen and changed things. My interest in training of the young athlete is personal and professional. As a parent it’s pertinent. As a coach, I spend the first two decades focusing on the peak years of sports performance, generally speaking 16 to 36 years of age. During the last decade and a half, I have sought to gain extensive experience in the practical application of training the young athlete, with the view to developed real world contributions to the multi-year periodization models I had developed during the prior decades. Additionally, I now also have a responsibility for the athletes who I trained during the 1980s and 1990s who now face the challenges of both aging and damage from sport at the elite level during their younger adult years. To add to this, they also bring their children to me, so my recent (last 15 years) focus on young training is serving all well. The over structuring of young sports training in general. For the purposes of this discuss I refer to the ages of 0-16 yrs as ‘young athlete’. I was able to apply my theories in relation to these concerns in my review of contemporary training habits in the island of Fiji. I’m not the first to raise this concern, and I won’t be the last – unless things change globally, which I am not optimistic about. Essentially, in a world where children ‘play’ time is potentially reduced on prior generations, where their play time is less play and more electronic interaction, I believe what little play time available should be used to develop the general athletic skills needed to optimize long term athlete potential. Nothing new about this, I appreciate, and most would agree. Where the paths diverge is how the sports training is conducted. Where adult coaches speak a lot, where adult concepts and emotions dominate, where winning is the most important things, where a lot of whistles are blown, where kids are taught structure (tactics) before technique, where ‘fitness’ training equals (or in some cases dominates) technical training – this is the world of young sports training I see dominate. My solution? Less structure, less adult involvement, more skill and fun based activity. Again, this is nothing new. Books have been written on this subject, such as the excellent book ‘Just Let the Children Play’ by Bob Bigelow. For whatever reason, it’s for the most part lip service around the world. The children are not being allowed to play. Except in the places like islands in the Pacific Ocean. I am happy to report the children do still play. They play more than they do in the more developed western world. And this is good! 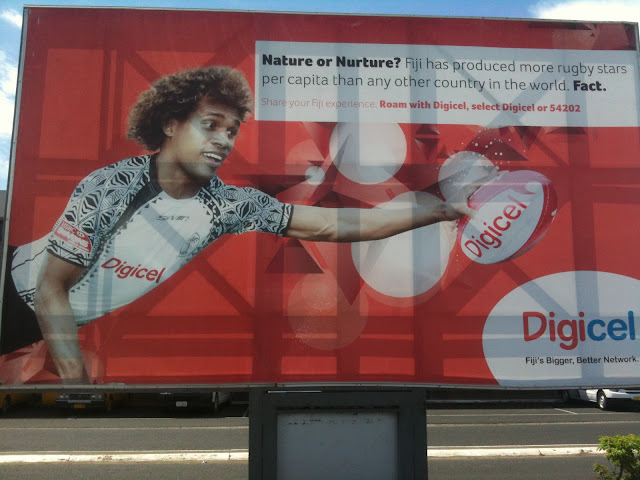 In my opinion it explains why the first thing you see when you arrive in the terminal at Nadi – in a poster over the bag carousel, and the last thing you see at departure at the International terminal in Nadi – in a billboard in the parking lot – is this boast – more rugby champions per capita are developed in Fiji than in any other country. Based on my observations, since about 1980 there has been a progressive downward movement in age as to who has formal ‘strength and conditioning’ programs provided. As of now, it is not uncommon for children as young as 10 years of age to be exposed to formal ‘‘strength and conditioning programs. I see two main challenges with this. The first one is the imbalance of time and effort dedicated to the athletic qualities – which, based on Tudor Bump’s influence, I indentify as technical, tactical, physical and psychological. In essence, I see too many young athletes being exposed to non-specific physical development programs and training who are seriously lacking in technical and tactical development. What we are creating, in my opinion, is a generation of athletes who cannot pass, kick or catch a ball very well, but are really ‘strong and conditioned’. To be more accurate they look like they are. This early imbalance, again in my opinion, will lead to inability for the athlete to fulfil their potential in the long term. The second concern I have is with the application of training programs that have significant flaws in them. This simply means the young athletes have more years on inappropriate physical training programs, and as a result develop injuries and undergo surgery earlier than their predecessors. I am confident this would be statistically supported in any appropriate survey or research. One day, there will be a greater awareness and acceptance of the flaws that have existed in these training programs, and ideally the damaging content will be reduced, if not eliminated. However this optimism may take many years if not decades to be realized, at best. There is a perception in our marketing driven western world sporting environment that you need not only equipment, but you need the latest equipment. For those exposed to it, his paradigm leaves those without a lot of equipment or not the latest equipment with a sense of inadequacy, and those with both a false sense of confidence. However for those not exposed to it, it has no relevance or impact. Essentially kids need very little if any equipment to create play. I have seen many young athletes playing on the street with a crushed soft drink can, or in a park or in a village with an old volleyball, soccer ball or rugby ball. In Fiji equipment is scare. In most Pacific island equipment is scarce. Yet Fiji still have reason to claim they produce more rugby stars per capita than any other country. And the Pacific Island continue to be a rich provider of athlete talent for many sports who recruit them from the islands. I visited the classrooms of a primary school in Fiji recently, with a group doing volunteer work, and noted the humble resources they had available. I was keen to learn the correlation between this ‘disadvantages’ as we would perceive it in our developed countries, with their educational development. Without proclaiming to be an educational expert, I informally took the pulse of these kids in the basics of readying, writing and arithmetic (see the video below – note it's rough and its sideways - unbeknown to me the kids were filming it!) I started out by giving them my Phone to play with and it was obvious the overwhelming majority didn’t know what it was. I was very happy with what I heard and saw. I don’t believe they were ‘disadvantaged’ as much as we may have believed because of our skewed reliance on resources and equipment. In countries devoid of TV and other electronic devices, kids are forced to play. In countries devoid of heavy western eating influences, the kids eat more the traditional diets. Although not as traditional as the generations before them, anything is better than a diet of fast foods that kids in Western countries get exposed to. During the last few decades the kids in the Pacific islands have been devoid of TV and other electronic devices, and most had not seen or heard of McDonalds. Inevitably this will change, and the pool of talent will dry up. There will come a time when we need to take this optimal lifestyle more seriously to ensure we optimally develop the young athlete. Just as the American dentist Weston-Price concluded in his early 1900’s study of traditional nutrition, where he concluded that shifting to westernized nutrition was a step backwards as relates to health, I believe that as we shift from more traditional play based lifestyles for our young athletes, the future athletic potential is also diminished. Whilst it may not be possible or even appropriate to completely turn back the clock, I believe any parents and or coaches interested in optimizing the long term athletic ability of the young athlete can and should take some lessons from the experiences shared by the children in more traditional less-westernized cultures, such as the Pacific Islands. That's just great stuff coach. Thank you!